One of the first video poker games to hit the online casino landscape was Jacks or Better Video Poker. 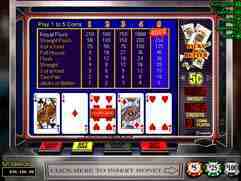 Jacks or Better Video Poker has been around for as long as online casino players can remember. Arguably the most popular video poker game played online, Jacks or Better is played like most other video poker games, and is fairly simple to get the hang of. The game begins with you (the player) being dealt five cards. You must then make a decision as to which cards you'd like to keep and which ones you'd like to throw away. You'll receive new cards in exchange for those that you've elected to discard and you'll be paid out according to the game's pay table. As we reiterate throughout all of our video poker game reviews; be sure to play the maximum coins in order to give yourself the best odds possible. In addition to this mantra, it's important when playing Jacks or Better to make certain that you're seated at a Full Pay video poker machine. The term "full pay" refers to the full player payout of 9-1 on a full house, and 6-1 on a flush. A "full pay" Jacks or Better Video Poker machine is also commonly referred to as a 9/6 Jacks or Better Video Poker game and this game's payout is an extremely favorable 99.5%. It's worth mentioning that most Jacks or Better games are not full pay, as they pay out at 8-1 on full houses, and 5-1 on flushes. On these machines, the payout percentage dips to a chilly 97.3%, which is considerably lower than the 9/6 versions of the game. Some 8/5 versions of Jacks or Better will compensate for their poor pay tables by offering a progressive jackpot, however, even taking this into account, you're far better off finding a 9/6 machine to play at. In addition to these two variations, some casinos will also offer a 7/5 pay table, which is just about the worst machine that you can sit down at. If you happen to find a 7/5 Jacks or Better machine, steer clear of it in favor of another video poker game or hold out until you come across at least an 8/5 one featuring a progressive jackpot. 1. Always hang onto a winning hand unless you've been dealt four cards to a Royal Flush. If you’re ready to start playing Jacks or Better video poker online, head over to Silver Oak Casino today! This reputable online casino has tons of different video poker games to choose from; including Joker Poker, Mystery Poker, and of course Jacks or Better! Plus, when you signup and make your first deposit, you can get up to $10,000 in free video poker bonuses at Silver Oak Casino! Slots Plus Casino, a fun and exciting RTG powered online casino, is one of our favorite places to play Jacks or Better video poker. In fact, they are one of our favorite places to play all kinds of video poker games! The main reason we like them so much is because they have one of the best video poker bonuses you can find online. For a limited time, you can get up to $3,000 in free video poker bonuses when you make a deposit at Slots Plus Casino. You can use this bonus money to play Jacks or Better video poker or any other game that you want, so take advantage of it today before it’s too late! Vegas Crest Casino is a Rival powered casino that has hundreds of real money games to choose from; including slots, blackjack, and Jacks or Better video poker! They also have a lot of great bonuses to choose from! For example, as a new player, you can get a 300% bonus when you make your first deposit. This bonus is worth up to $3,000 and can be used to play Jacks or Better video poker, so take advantage of it today before it’s too late! At Vegas Casino Online, there is a jungle of video poker games for you to choose from; including the most popular video poker game, Jacks or Better video poker! And right now, this trusted online casino is currently offering one of the biggest video poker bonuses around! When you make your first deposit, they’ll give you up to $5,000 in free casino money that you can use on the Jacks or Better video poker machine! You can play slots, blackjack, and Jacks or Better video poker at the popular iNetBet Casino. This online casino does a fantastic job of making your experience just as thrilling as a land based casino, but you never have to leave the comfort of your own home! They also have a little something that land based casinos can’t offer; a fantastic welcome bonus worth up to $150 in free casino money! To get in on the action, simply visit iNetBet Casino today!